It’s been a few years since we fished for Salmon on the Miramichi River in Canada. I have always wanted to try making smoked salmon at home and so when we bought some lovely Atlantic Salmon at the market I decided it was time to give it a go. Remove any pin bones then score the skin with a sharp knife. Then you need to prepare a cure. Place on a wire rack and leave in the fridge. You need to leave it for at least four hours until the surface becomes tacky. This will help the smoke to adhere. Smoke on a rack for 6 hours. We use an old BBQ and used a tin with charcoal wood chips . Once smoked, keep in fridge until needed. 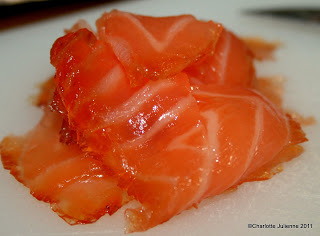 Slice the smoked salmon thinly with a very sharp knife.